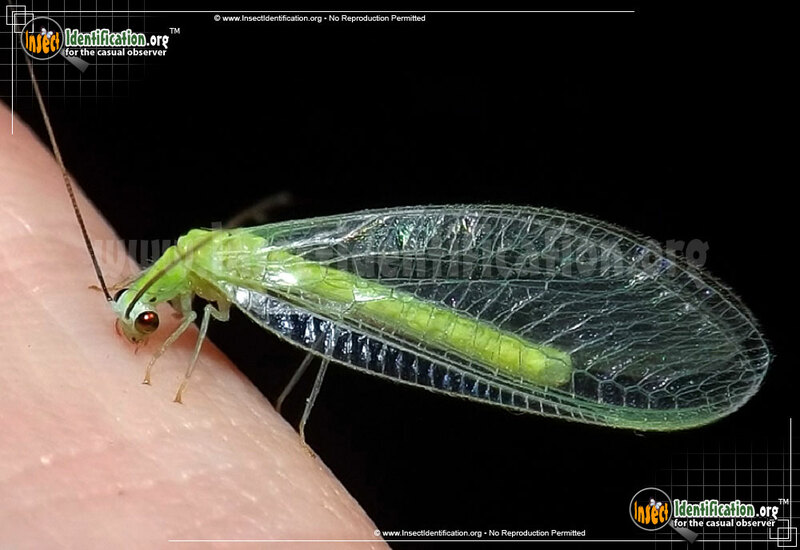 Detailing the physical features, habits, territorial reach and other identifying qualities of the Green Lacewing. The minty-colored, dainty Green Lacewing is a wonderful friend to the gardener thanks to their voracious appetite for plant pests. 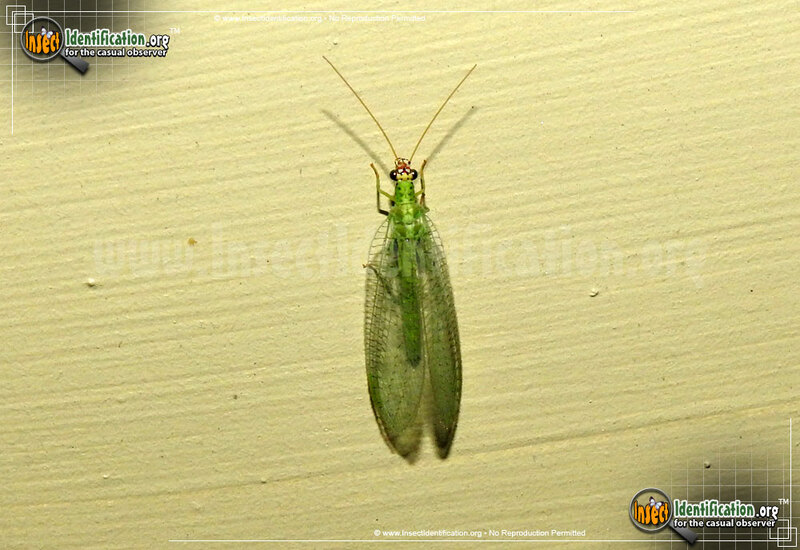 Green Lacewings are widespread across North America. They are small and look very delicate thanks to transparent wings covered in fine green veins. 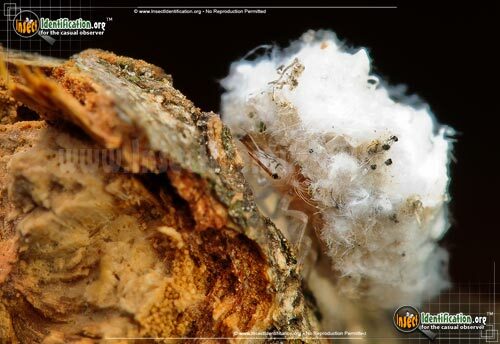 They emit a foul smelling secretion when threatened. 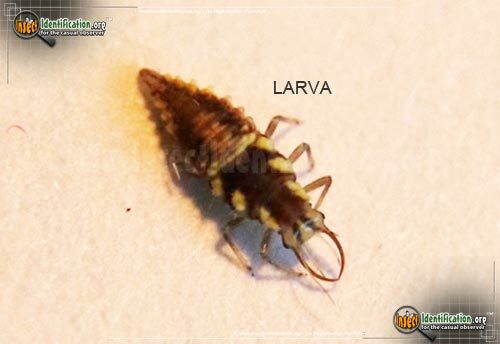 They are nocturnal as adults and can be found visiting gardens, flower beds, parks, meadows, farms, and fields at dusk. Their flexibility when it comes to habitat and diet may explain their huge range. 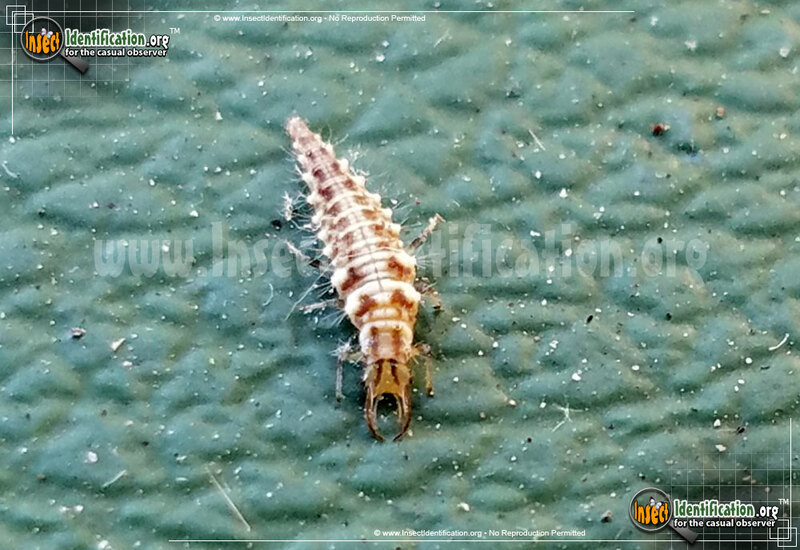 Adult Green Lacewings eat aphids, the 'honeydew' created by aphids, and pollen. Some species eat mealworms and other vegetable-harming insects. They can be bought and sold online, much like useful Lady Beetles, thanks to their diet. Thousands are raised every year for deliberate release inside greenhouses, orchards, farms and gardens. 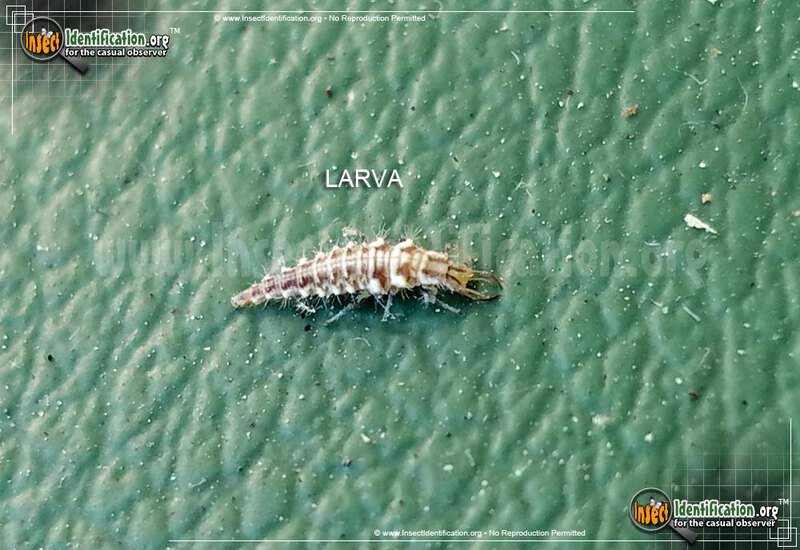 The larval Green Lacewing doesn't look like an insect at first glance. 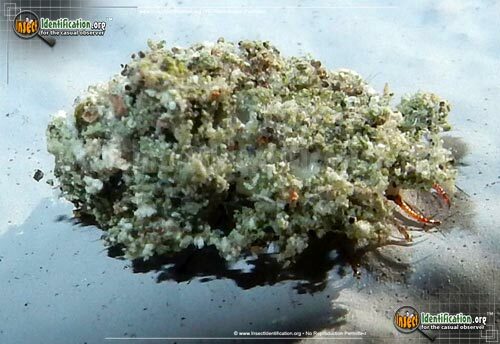 It covers itself with piles of plant litter and dead insect debris. This coat of camouflage is collected early after hatching in order to conceal itself from predators like ants. 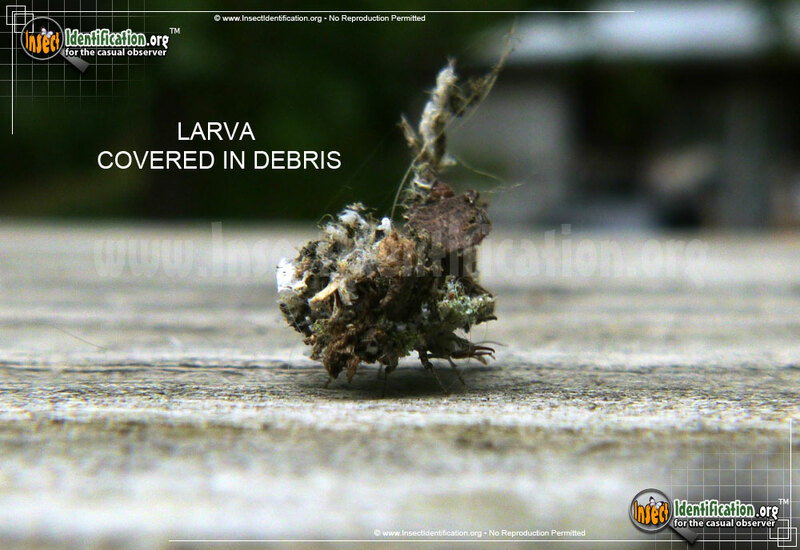 Green Lacewing larvae have huge appetites. 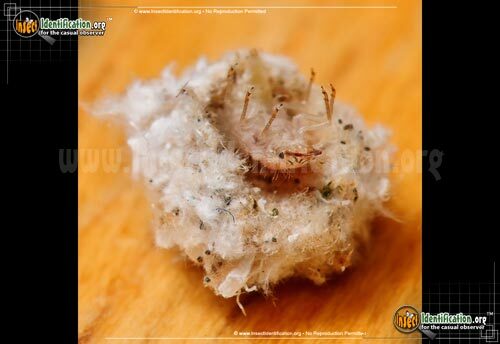 They hatch and are immediately hungry. 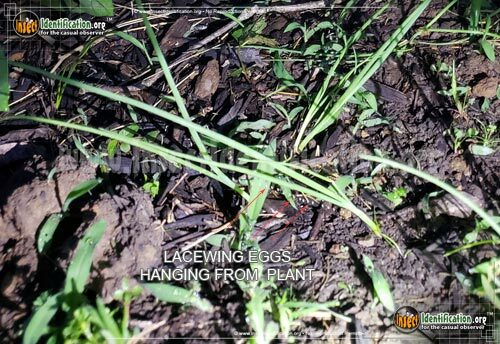 Females lay tiny white eggs from thin, dangling lines on a leaf or plant stalk to provide some distance between siblings so they don't rush to eat each other as they hatch. 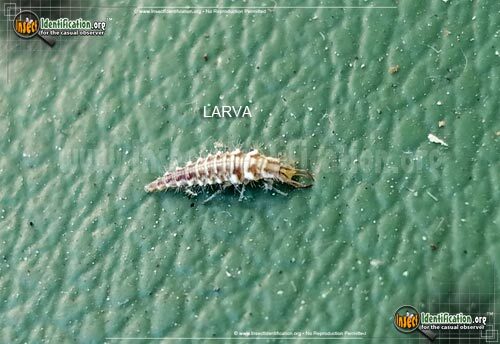 Larvae eat any small insect they encounter, and aphids (smaller flying insect that are the bane of gardeners and growers) are on top of the list. 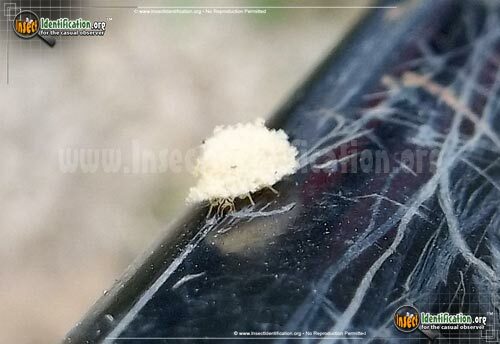 For this reason, they are also called "aphid lions". Aphids are a garden pest because they drink the juices of young plants, often killing them. 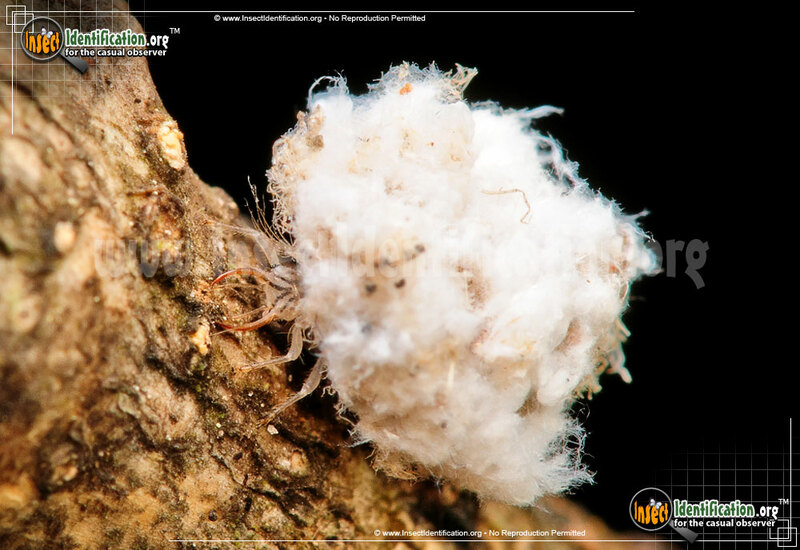 Infestations are difficult to eliminate due to their small size and rapid reproduction rate. Ants herd aphids like sheep in order to collect the sweet 'honeydew' they secrete from their bottoms. 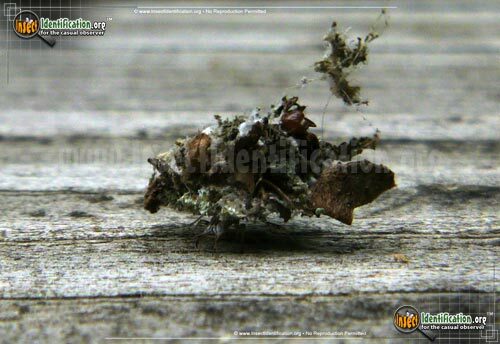 Because Green Lacewing larvae eat aphids, ants are quick to kill them to protect the herd, hence the need for camouflage. 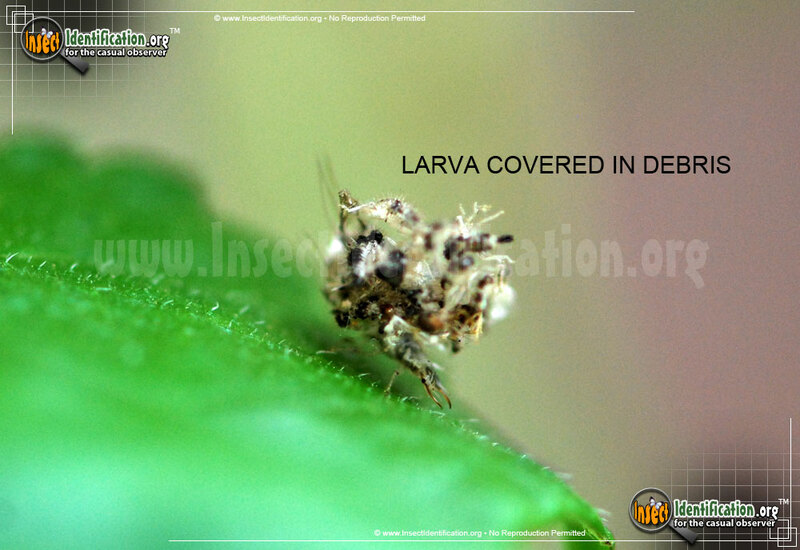 If left undisturbed by ants, Green Lacewings can control aphid populations without the need for chemical pesticides. 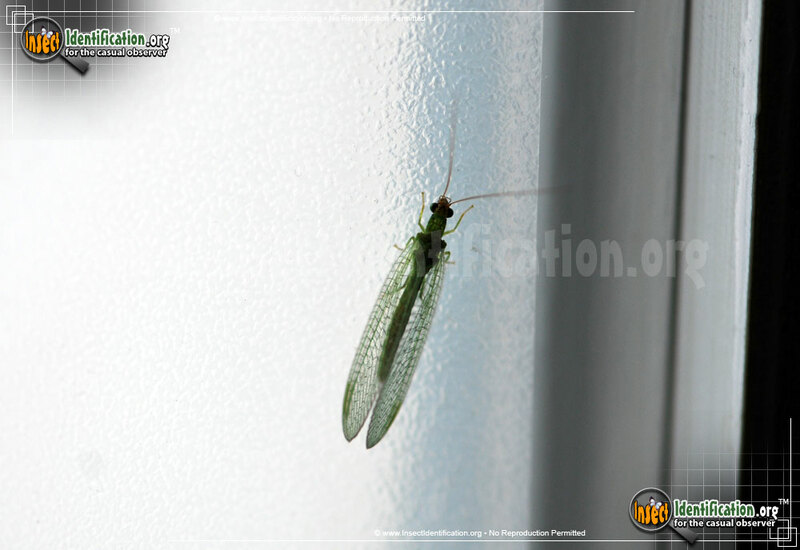 Mature Lacewings are most active in the summer months. 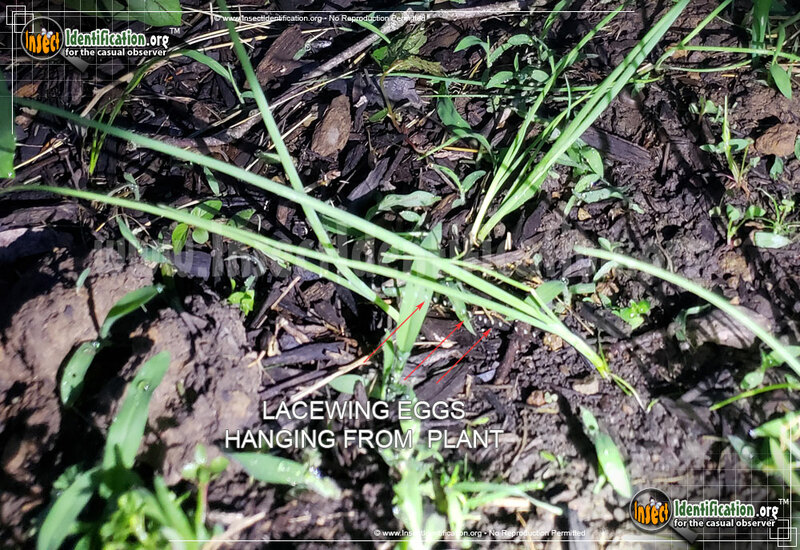 Look for a row of Lacewing eggs hanging from a fine thread on blades of grass or plant stalks in the spring and celebrate if you find them. 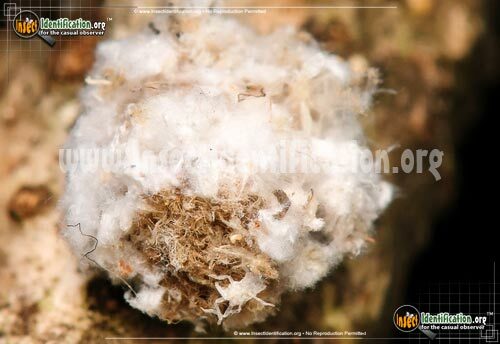 Those welcome, tiny dirtballs will become flying adults by the summer.